PATZKOWSKY, Samuel1, RANDALL, Emily2, ROSEN, Madison3, THOMPSON, Addison4, MOUA, Pa Nhia5, SCHANTZ, Krysden2, POLLOCK, Meagen2, JUDGE, Shelley2, WILLIAMS, Michael2, MATESICH, Cam2. (1) Franklin & Marshall College, Earth and Environment Department, 415 Harrisburg Ave, Lancaster, PA, 17603, (2) The College of Wooster, Department of Geology, 944 College Mall, Wooster, OH 44691, (3) Mount Holyoke College, Department of Geology, 50 College Street, South Hadley, MA, 01075, (4) Pomona College, Department of Geology, Sumner Hall, 333 N College Way, Claremont, CA 91711, (5) Carleton College, Department of Geology, One North College Street Northfield, MN 55057. JOSHUA CHARLTON (The College of Wooster), ALORA CRUZ (Macalester College), KERENSA LOADHOLT (Oberlin College), MYRON LUMMUS (Trinity University), CHRISTOPHER MESSERICH (Washington and Lee University), Wiles, G., Buma, B., Krapek, J. 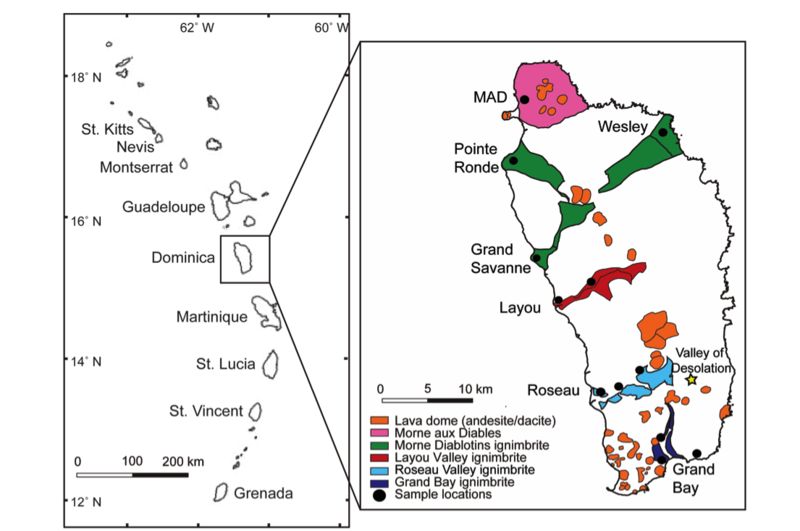 A PETROLOGIC EVALUATION OF THE LAYOU IGNIMBRITE AND MORNE TROIS PITON LAVA DOME: HOW DO CHANGES IN PRE-ERUPTIVE CONDITIONS AFFECT ERUPTIVE BEHAVIOR? What: How old is that volcano? How old is that tree? This Keck Gateway Project will explore how geologists date Earth materials, focusing on young lava flows and trees that are on the decline. Our geochronological study will supplement ongoing volcanological and climate change research in Utah and Alaska. Team Utah (led by Dr. Pollock) will be investigating the age of young basaltic lava flows in Utah’s Ice Springs Volcanic Field. Team Alaska (led by Dr. Wiles) will be reconstructing the growth history and recent climate response of yellow-cedar in Juneau, Alaska. Both of these projects are important to society. Ice Springs Volcanic field presents a potential volcanic hazard and is a region of geothermal interest. Alaska’s yellow-cedar has economic and cultural value, and has been on the decline in the past few decades. Project Overview: Students will work on one of two research teams led by Dr. Meagen Pollock and Dr. Greg Wiles. During this 5-week summer experience, both teams will be based at The College of Wooster in Ohio. Each team will visit their respective field sites and will learn cutting-edge analytical techniques in geochronology: dendrochronology and cosmogenic dating. The teams will have the opportunity to interact with geoscience professionals from state geological surveys, the forest service, and the energy and GIS industries. Teams will share their findings with the scientific community next October through a poster presentation at the 2017 annual meeting of the Geological Society of America in Seattle, WA. 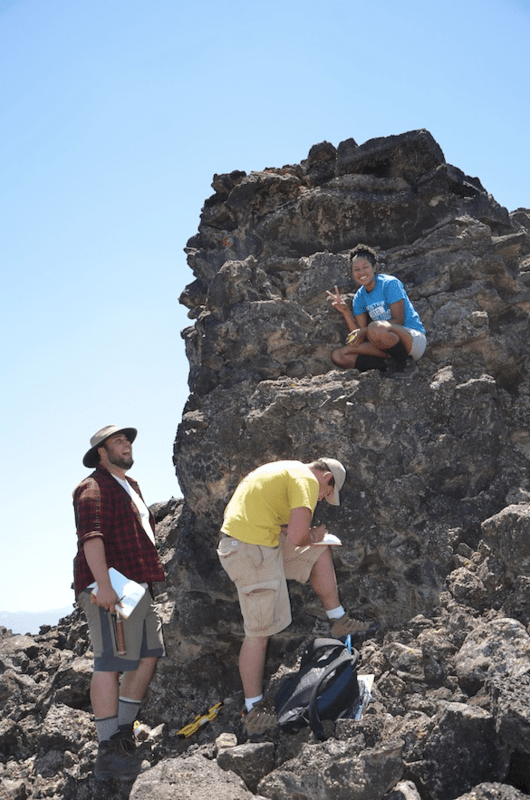 Team Utah Goals and Student Projects: Ice Springs Volcanic Field (ISVF) is a young, 20 km2 monogenetic basalt field in Utah’s Black Rock Desert (BRD), composed of four nested cinder cones and three distinct lava lobes. The lava flows can be separated into two compositional groups that are referred to as “high silica” and “low silica” lava flows (Sims, 2013; Thompson, 2009). The complex compositional variations and eruptive history make the ISVF an ideal case to test the applicability of the monogenetic eruption classification scheme proposed by Németh and Kereszturi (2015). According to their classification, the ISVF as a polymagmatic compound monogenetic field (Williams, 2016). The only aspect of this classification that is poorly constrained is the timing. The relative timing for ISVF was first proposed by Condie and Barsky (1972), who placed placed the age of ISVF at ~4000 years. Hoover (1974) suggested that the ISVF may be as young as ~1000 years because it is well preserved. Only one age of 660 +/- 170 years has been published for the ISVF, estimated by radiocarbon dating of a tree root fragment found beneath a lava flow (Valastro et al., 1972). In an effort to address the uncertainty in the emplacement history of the Miter flows, Schantz (2016) recently used cosmogenic 36Cl methods to date the low silica lava flows in an area west of Miter cone and found a preliminary age of 8.7 +/- 1.1 kyr. The goal of the Team Utah project is to use cosmogenic 36Cl methods to date the low- and high-silica lava flows in the ISVF. Students will collect samples from the low- and high-silica lava flows, prepare the samples for geochemical analysis, measure the elemental and isotopic compositions of the samples, and process the results with the CRONUS Web Earth Calculator to determine an age for the lava flows. An age estimate will allow us to (1) constrain the timing of ISVF volcanism relative to the development of the BRD, (2) answer questions about the emplacement of lava flows, and (3) test the classification of the ISVF as a polymagmatic compound monogenetic field. Team Alaska Goals and Student Projects: The decline of Alaska yellow-cedar (Callitropis nootkatensis (D. Don) Örsted ex D.P. Little) is a fascinating and ongoing case study of how a changing climate impacts the coastal temperate forests in British Columbia and Alaska. Yellow-cedar has a high cold tolerance and is well adapted to cool climates (Schaberg et al. 2005, 2008). Its shallow root systems require a deep snowpack to insulate the roots from hard frosts that can damage roots and potentially lead to the death of the tree (Schaberg et al. 2008). Yellow-cedar is extremely durable, economically valuable (Kelsey et al. 2005), and long-lived, with reports of trees with as many as 1824 annual rings (Pojar and MacKinnon 1994). In addition, it is widely used by the native Tlingit with most stands utilized and their bark sustainably stripped over the past 300 years and into the present. The start of the decline, ca. 1880–1900 (Hennon et al. 2007), coincides with a period of warming starting at the end of the Little Ice Age (LIA) (Schaberg et al. 2008; Kelsey et al. 2005; Beier et al. 2008). This similarity in timing between the decline and the end of the LIA has led to the development of the leading hypothesis that reduced insulating snowpack has caused premature root dehardening and frost damage (Hennon et al. 2005; Beier et al. 2008; Schaberg et al. 2008; Lamb and Wurtz 2009). To test the link between snowpack and yellow-cedar health, The College of Wooster Tree Ring Lab (WTRL) has undertaken dendroclimatic studies (Wiles et al., 2012; Jarvis et al., 2012; McGrath et al., 2014, 2016) in Glacier Bay National Park and Preserve. In all of these studies we have compared annual tree growth using ring-widths with meteorological data to determine how yellow-cedar has responded to climate over the last 180 years. We have now developed three sets of tree-ring time series at three yellow-cedar sites. The chronologies consist of the traditional ring-width records and new novel measurements using blue intensity (BI) measurements (Rydval et al., 2014; Wilson et al., 2015) . This relatively new parameter is now measured at the WTRL. The BI series for our three cedar sites in Glacier Bay National Park and Preserve and Juneau, the results are remarkable (McGrath, et al., 2016) and new data we aim to generate in this project can be used to further test the leading hypothesis for yellow-cedar decline. The goal of the proposed work is to sample tree-ring sites along elevational transects in the Juneau region and develop chronologies (ring-width and BI records) and to compare these records with meteorological records from stations along the Gulf of Alaska and with gridded data from the North Pacific. These comparisons will allow us to ask new questions about the forest decline in the region. Students will sample at multiple sites in the mountains surrounding Juneau, interact with climatologist, ecologists and foresters at the University of Alaska and the NFS, and then travel to the WTRL for intensive data collection and analyses. Logistics and Field Conditions: The 5-week summer experience is based at The College of Wooster. Most of the work will occur in the Wooster Tree Ring and X-ray labs with opportunities to visit external labs, such as the PRIME lab at Purdue University. Approximately one week is designated for off-campus field work. Field work in Utah will be hot and sunny while field work in Alaska may be wet and cool. The terrain in both field sites can be rugged. Portions of field work in Alaska may be remote and may require transport over water. Note that no outdoor experience is required. Please contact us if you have questions or concerns about the logistics and field conditions. Recommended Courses/Prerequisites: Enthusiasm, willingness to try something new, and a commitment to work with others! An introductory geoscience course is recommended but is not required. Adams, H.D., Macalady, A.K., Breshears, D.D., Allen, C.D., Stephenson, N.L., Saleska, S.R., Huxman, T.E., and McDowell, N.G., 2010. Climate-induced tree mortality: Earth system consequences. Eos, Transactions, American Geophysical Union, 91: 153-154. Allen, C.D., Macalady, A.K., Chenchouni, H., Bachelet, D., McDowell, N., Vennetier, M., Kitzberger, T., Rigling, A., Breshears, D.D., Hogg, E.H., Gonzalez, P.,Fensham, R., Zhang, Z., Castro, J., Demidova, N., Lim, J., Allard, G., Running, S.W., Semerci, A., and Cobb, N., 2010. A global overview of drought and heat-induced tree mortality reveals emerging climate change risks for forests. For. Ecol. Man., 259: 660-684. Beier, C.M., Sink, S.E., Hennon, P.E., D’Amore, D.V., and Juday, G.P, 2008. Twentieth-Century warming and the dendroclimatology of declining yellow-cedar forests in southeastern Alaska. Can. Jour. For. Res. 38: 1319-1334. Brenna, M., Cronin, S.J., Smith, I.E.M., Sohn, Y.K., and Németh, K., 2010, Mechanisms driving polymagmatic activity at a monogenetic volcano, Udo, Jeju Island, South Korea: Contributions to Minerology and Petrology, v. 160, p. 931–950. Brenna, M., Cronin, S.J., Németh, K., Smith, I.E.M., and Sohn, Y.K., 2011, The influence of magma plumbing complexity on monogenetic eruptions, Jeju Island, Korea: Terra Nova, v. 23, p. 70–75. 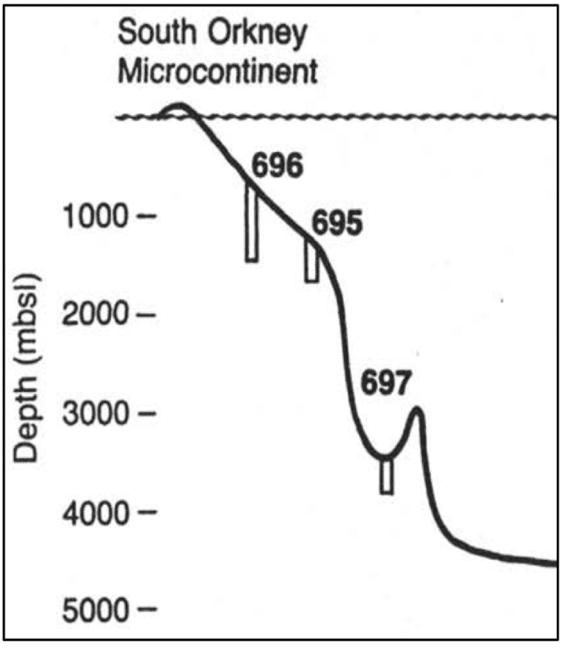 Condie, K.C., and Barsky, C.K., 1972, Origin of Quaternary basalts from the Black Rock desert region, Utah: Geological Society of America Bulletin, v. 83, p. 333–352. Glibert, G.K., 1890, Lake Bonneville: United States Geological Survey, monograph 1, 438 p.
Hoover, J.D., 1974, Periodic Quaternary volcanism in the Black Rock Desert, Utah: Brigham Young University, 70 p.
Hennon, P.E., and Trummer, L.M., 2000. Yellow-cedar (Chamaecyparis nootkatensis) at the northwest limits of its natural range in Prince William sound, Alaska. Northwest Science, 75: 61-71. Hennon, P.E., D’Amore, D.V., Zeglen, S., and Grainger, M., 2005. Yellow-cedar decline in the north coast forest district of British Columbia. United States Department of Agriculture Research Note PNW-RN-549: 1-16. Hennon, P.E., Woodward, B., and Lebow, P., 2007. Deterioration of wood from live and dead Alaska yellow-cedar in contact with soil. For. Prod. Jour., 57: 23-30. Jarvis, S. K., Wiles, G.C., Appleton, S.N., D’Arrigo, R.D. and Lawson, D.E., 2013, A warming-induced biome shift detected in tree growth of Mountain Hemlock (Tsuga mertensiana (Bong.) Carrière) along the Gulf of Alaska. Arctic, Antarctic and Alpine Research 45, DOI 10.1657/1938-4246-45.2. 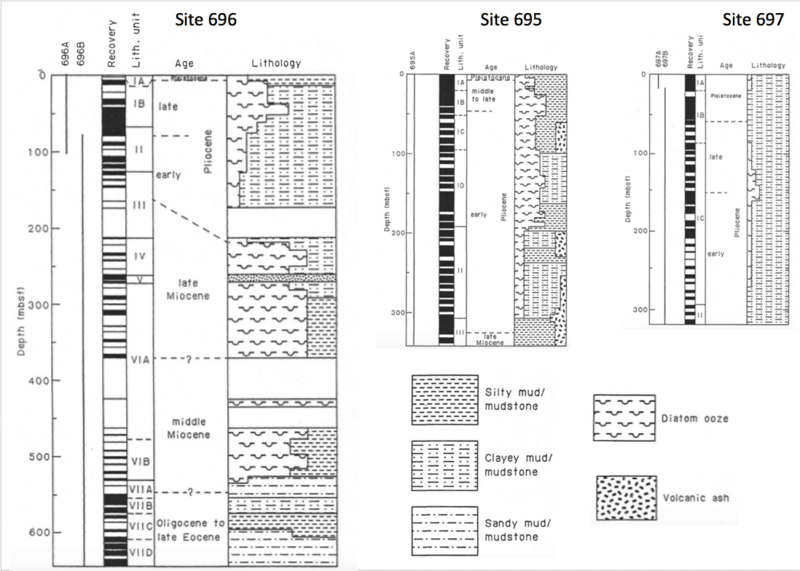 Jordan, S.C, Jowitt, S.M., and Cas, R.A.F., 2015, Origin of temporal—compositional variations during the eruption of Lake Purrumbete Maar, Newer Volcanics Province, southeastern Australia: Bulletin of Volcanology, v. 77, p. 1–15. Kelsey, R.G., Hennon, P.E., Huso, M., and Karchesy, J.J., 2005. Changes in heartwood chemistry of dead yellow-cedar that remain standing for 80 years or more in southeast Alaska. Jour. of Chem. Ecol., 31: 2653-2670. Kereszturi, G., Németh, K., Cronin, S., Procter, J., and Augistin-Flores, J., 2014, Influences on the variability of eruption sequences and style transitions in the Auckland Volcanic Field, New Zealand: Journal of Volcanology and Geothermal Research, v. 286, p. 101-115. Lamb, M., and Wurtz, T., editors, 2009. Forest health conditions in Alaska- 2008. United States Forest Service Protection Report R10-PR-20: 1-102. Little, D.P., Schwarzbach, A.E., Adams, R.P. and Hsieh, C.F., 2004, The circumscription and phylogenetic relationship of Callitrospis and the newly described genus Xanthocyparis (Cupressaceae). Am. Jour. of Bot., 91: 1872-1881. Lynch, W.C., and Nash, W.P., 1980, Chemical trends in the Ice Springs Basalt, Black Rock Desert, Utah: U.S. Government Documents (Utah Regional Depository), 86 p.
McGrath, S., Howell, W., Wiesenberg, N., Mennett, C., and Wiles, G., 2014, Three hundred years of continuity: a yellow cedar bark stripping site on Pleasant Island, Icy Strait, Southeast Alaska: Geological Society of America Abstracts with Programs. Vol. 46, No. 6, p. 247. McGrath, S., Luna, E., Wiesenberg. N., and Wiles, G.C., Examining the effects of a changing climate on Alaska Yellow Cedar: Analyses of ring width and blue intensity tree ring chronologies: Geological Society of America Abstracts with Programs. Vol. 48, No. 7 doi: 10.1130/abs/2016AM-280922. Németh, K., and Kereszturi, G. 2015, Monogenetic volcanism: personal views and discussion: International Journal of Earth Science 2131-2146. Pojar, J., and MacKinnon, A., (editors), 1994. Plants of the Pacific northwest coast. Vancouver, Lone Pine Publishing, 527 p.
Schaberg, P.G., Hennon, P.E., D’Amore, D.V., Hawey, G.J., and Boerer, C.H., 2005. Seasonal difference in freezing tolerance of yellow-cedar and western hemlock trees at a site affected by yellow cedar decline. Can. J.For. Res. 35: 2065-2070. Doi:10.1139/x05-131. Schaberg, P.G., Hennon, P.E., D’Amore, D.V., and Hawley, G.J., 2008, Influence of simulated snow cover on the cold tolerance and freezing injury on yellow-cedar seedlings. Glob. Chan. Biol., 14: 1-12. Rydval, M., L-Ã. Larsson, L. Mcglynn, B. Gunnarson, N. Loader and R. Wilson. 2014. Blue Intensity for Dendroclimatology: Part I – Should we have the blues? Experiments from Scotland. Dendrochronologia 32: 191-204. Schantz, K., 2016, The use of multiple dating methods to determine an age of basalt in the Ice Springs Volcanic Field, Millard County, Utah: [Undergraduate Thesis] The College of Wooster. Sims, W., 2013, Geochemical and geospatial analysis: Mapping of Miter’s lava flows in Ice Springs Volcanic Field, Black Rock Desert, Utah: [Undergraduate Thesis] The College of Wooster. Thompson, J., 2009, Crustal assimilation mechanisms in continental basalts: the Ice Springs flow, Utah: University of Iowa, 203 p.
Valastro, S., Davis, E.M., and Varela, A.G., 1972, University of Texas at Austin radiocarbon dates, IX: Radiocarbon, v. 14, p. 461–485. Walker, G.P.L., 1993, Basaltic-volcano systems: Geological Society, London, Special Publications, v. 76, p. 3–38. 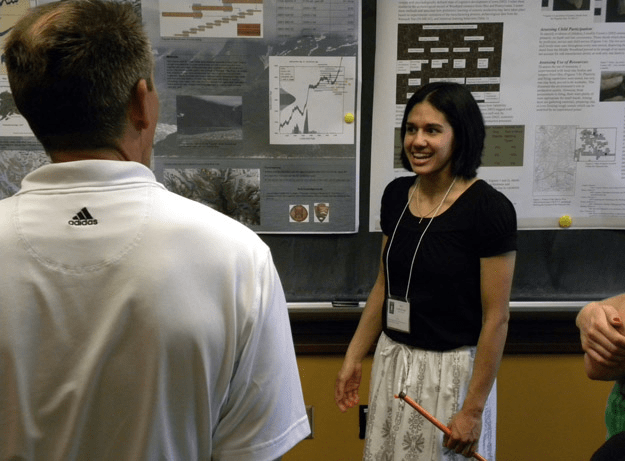 Williams, M., 2016, Emplacement processes and monogenetic classification of Ice Springs Volcanic Field, central Utah: [Undergraduate Thesis] The College of Wooster. Wiles, G.C., Mennett, C., Jarvis, S.K.,,Lawson, D., Wiesenberg, N., and D’Arrigo, R, 2012, Decline in Alaskan Yellow-Cedar: tree-ring investigations into climatic responses and possible causes: Glacier Bay, Alaska: Canadian Journal of Forest Research, 42: 1–6 (2012) doi:10.1139/X2012-028. Wiles, G., M. Happ, R. Oelkers, R. Wilson, R. D’Arrigo, O. Solomina, N. Davi, L. Andreu-Hayles and K Anchukaitis. 2016. Development of Blue Intensity chronologies along the North Pacific rim. Ameridendro, Mendoza, spring 2016. Wilson, R., R. Rao, M. Rydval, C. Wood, L. Larson and B. Luckman. 2014. Blue intensity for dendroclimatology: Part II – The BC Blues: A case study from British Columbia, Canada. The Holocene DOI: 10.1177/0959683614544051. What: Sea level rise is observed in many coastal areas from remote islands in the Pacific to naval bases in Richmond, VA. Critical to modeling and then adapting to this sea level rise is understanding how fast ice sheets are melting (water into the oceans) and oceans are warming (thermal expansion). The first five Intergovernmental Panel on Climate Change (IPCC) reports suggested < 1.5 m average rise by the end of the twenty-first century. Some (e.g. Instar, 2016, Oppenheimer and Alley, 2016) now consider a 1.5-2 m average rise* by the end of the 21st century a possibility. There are many reasons for this revision, but the largest change is in our understanding of Greenland (not discussed) and Antarctic Ice Sheet dynamics. Antarctica is separated by the Trans-Antarctic Mountains into West and East. In West Antarctica and the Antarctic Peninsula, the Pacific side of Antarctica substantial parts of the ice sheets are shelves that float in the ocean and are therefore particularly prone to disintegration and melting. In 2002, NASA (2002) recorded the collapse of the Larsen B Ice Shelf on West Antarctica. Since then ice streams have accelerated their flow into the Weddell Sea (Rignot et al., 2004). 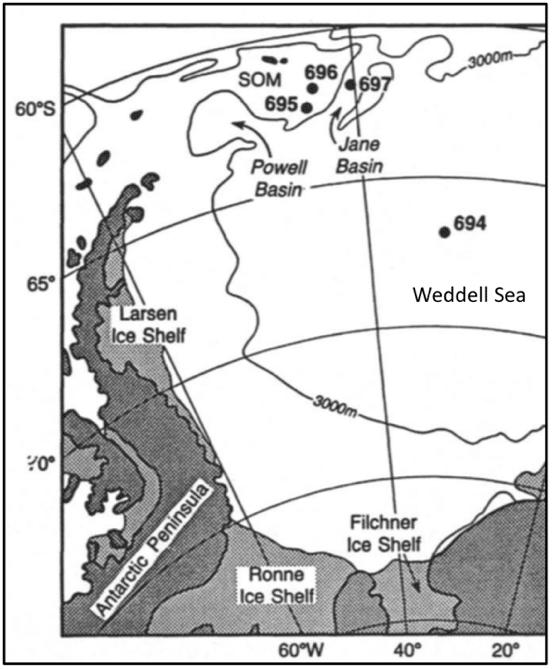 Looking back in time, Andrill drilling on the Ross Ice Shelf showed multiple Ross Ice Shelf collapses during the Pliocene (Andrill, 2009), when atmospheric CO2 levels where similar to today’s CO2 levels, about 400 ppm. In contrast, in East Antarctica the majority of the ice rests on stable craton and thus was considered unlikely to contribute to sea level rise in the next few centuries, if not millennia. However, recent research suggests that this is not the case. East Antarctic ice sheets are more unstable and susceptible to melting than previously thought. Examination of International Ocean Discovery Program Drilling (IODP) cores from Wilkes Land and other areas of East Antarctica, also showed considerable and unpredicted Pliocene melting (e.g. Williams et al., 2010, Cook et al., 2014). In this project we will look for evidence of ice sheet collapse and stability at three IODP Sites (695, 696, and 697) in the Jane Basin, south of the South Orkney Microcontinent. This area, also known as Ice Berg Alley, collects sediment from east and west Antarctica as currents and ice bergs exit the Weddell Sea and join the world’s oceans. *NOTE; There’s no such condition as “average rise” Tamisiea and Mitrovica. 2011. Figure 1. Modern bathymetric and oceanographic features of the northeastern Weddell and Scotia Seas. Solid red arrows show Weddell Sea Deep Water (WSDW), dense water above 4000m and Weddell Sea Bottom Water (WSBW), dense water deeper than 4000 m, exiting the Weddell Sea, joining Antarctic Circumpolar Current (ACC) and forming Antarctic Bottom Water (AABW). Yellow box (JB = Jane Basin) shows location of transect of ODP cores, PB = Powell Basin. (from Maldonado et al., 2003). Project Overview: Students will spend the first two weeks of the project at the IODP core repository at Texas A&M University (TAMU) in College Station, TX. During the day they will prepare and measure split cores for non-destructive analyses (description, XRF, magnetic susceptibility, color imaging, spectrophometry). Students will be expected to learn the basis for and be able to describe at least two of the measurements. 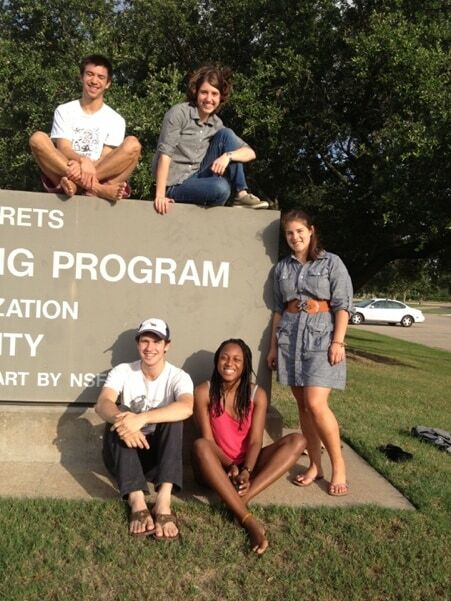 While at TAMU students will spend a day exploring opportunities for additional research and graduate school at the College of Geosciences (http://geosciences.tamu.edu/). The second two weeks (third and fourth) will be spent at Wesleyan University in CT. Figure 2. 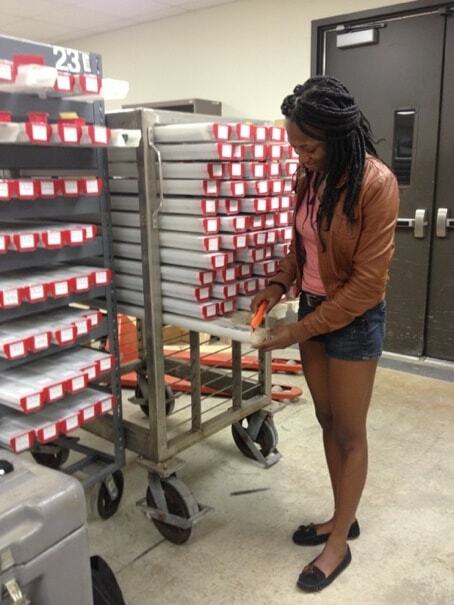 Nishaila Porter selecting cores at IODP. During the third week, Dr. Joseph Ortiz (Kent State University) will teach students how to do statistical analyses on the data they collected. They will learn how to do principal component and wavelet analyses to interpret their data (e.g. Ortiz, 2011, Yurco et al., 2010). During the fourth week, these analyses will continue. In addition, students will prepare posters to share their findings at the 2017 Geological Society of America meeting in Seattle, WA. Students are encouraged to work with their advisors to find funds that will allow them to continue their research during the summer beyond the 4-week Keck program. Figure 3. Group picture of Keck students at IODP during summer 2014. What is the influence and expression of orbital cycles from the different sediment components (XRF, magnetic susceptibility, spectral reflectance, and color), from different depths and time intervals? What changes in mineralogy and sediment chemistry are creating the signal? Satellite data shows increased chlorophyll (higher productivity) around areas with large melting icebergs attributed to increased nutrient supply from melting ice (Duprat et al., 2016). In the sediment is there a correlation with increased IRD, wt. % biosilica in the <63um fraction, Total Organic Carbon (TOC) and C/N ratio? Figure 4A. Location of three ODP sites to be studied, Sites 695, 696 and 697. SOM=South Orkney Microcontinent. Figure 4B. Relative depths of the three sites. Figure 4C. Simplified sediment lithologies with sediment recovery and age (old Pliocene/Pleistocene boundary). (From Leg 113 Preliminary Report). How far can icebergs travel? What is the source area for the sediments based on ages of hornblende and biotite from the 150-500 um fraction (Williams et al., 2010) and/or the petrology of ice rafted rocks large enough to make a thin-section? Can glass shards be used to date paleoceanographic changes and/or provide a higher resolution age model for Jane Basin sediments? If sufficient numbers of glass shards are identified, geochemistry (composition and isotopic dating) may be able to indicate the source area and the age of the event. Anderson, R.F., Chasea, Z., Fleishera , M.Q., Sachs, J, 2002. The Southern Ocean’s biological pump during the Last Glacial Maximum Deep-Sea Research II, 49, 1909-1938. 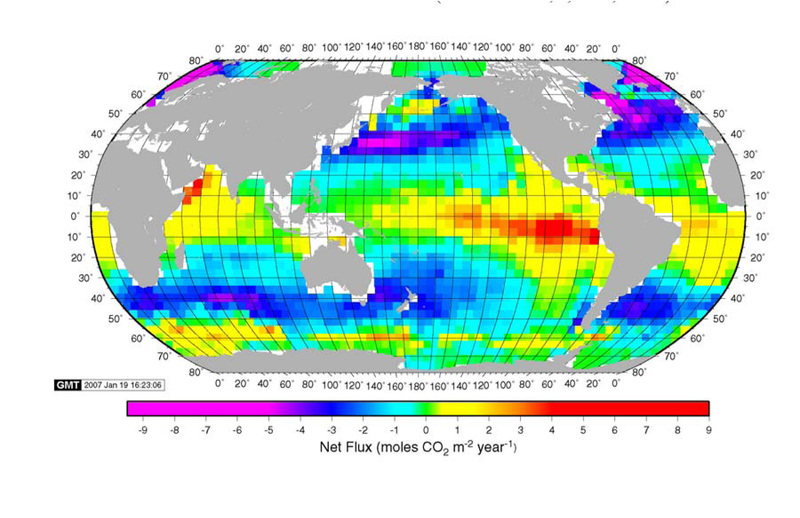 2005, Carbon-based ocean productivity and phytoplankton physiology from space, v.19, GB1006, doi:10.1029/2004GB002299. Cope, N. (2009). “Reconstruction of a paleoclimate using Diffuse Spectral Reflectance.” [Undergraduate thesis]: Kent, Kent State University, 67 p.
Cook, C. P., Hill, D.J., van de Flierdt, T., Williams, T., Hemming, S.R., Dolan, A. M., Pierce, E.L., Escutia, C., Harwood, D., Cortese, G., and Gonzales, J.J. 2014. Sea surface temperature control on the distribution of far-traveled Southern Ocean ice-rafted detritus during the Pliocene, Paleoceanography, 29, 533-548, doi:10.1002/2014PA002625. Hall, I.R. and McCave, I.N., 2000. Palaeocurrent reconstruction, sediment and thorium focusing on the Iberian margin over the last 140 ka. Earth Planet. Sci. Lett. 178, 151-164. Hambrey, M.J., Webb, P.-N., Harwood, D.M., and Krissek, L.A., 2003, Neogene glacial record from the Sirius Group of the Shackleton Glacier region, central Transantarctic Mountains, Antarctica, Geological Society of America Bulletin, 115, 994-1015. Hansen, J., Sato, M., Hearty, P., Ruedy, R., Kelley, M., Masson-Delmotte, V., Russell, G., Tselioudis, G., Cao, J., Rignot, E., Velicogna, I., Kandiano, E. , von Schuckmann, K., Kharecha, P., Legrande , A. N., Bauer, M. and K.-W. Lo, K.W., 2015. Kaufman, Z.S., 2016. “Sediment Interpretations of Ice Rafted Debris in the Weddell Sea, Antarctica: a 3-3.8 Mya Record from ODP Site 697” (2016). Honors Theses Paper 1605. Ma, Z., A. C. Ravelo, Z. Liu, L. Zhou, and A. Paytan (2015), Export production fluctuations in the eastern equatorial Pacific during the Pliocene-Pleistocene: Reconstruction using barite accumulation rates, Paleoceanography, 30, doi:10.1002/ 2015PA002860. Maldonado, A., Barnolas, A., Bohoyo, F., Galindo-Zaldivar, J., Hernandez-Molina, J.,, Lobo, F., Rodriguez-Fernandez, J., Somoza, L., and Vazquez, J., 2003. 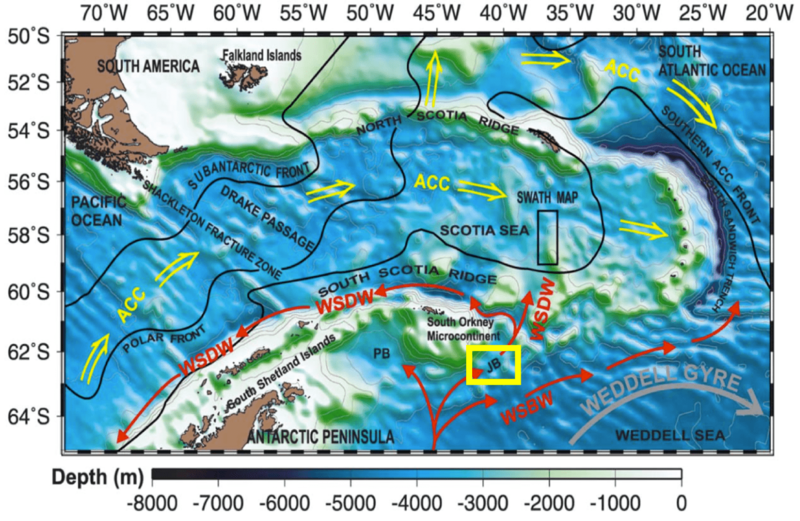 Contourite deposits in the central Scotia Sea: the importance of the Antarctic Circumpolar Current and the Weddell Gyre flows, Paleo3, 198, 187-221. Martinson, D. G., Pisias, N.G., Hays, J.D., Imbrie, J., Moore, T.C., Shackleton, N.J., 1987. Age dating and the orbital theory of the Ice Ages – development of a high-resolution 0 to 300,000-year chronostratigraphy. Quat. Res. 27, 1-29. Ortiz, J.D., 2011, Application of Visible/near Infrared derivative spectroscopy to Arctic paleoceanography: IOP Conf. Series, Earth and Environmental Science, v. 14, no. 1, 012011, doi:10.1088/1755- 1315/14/1/012011. Paytan, A., Kastner, M., Chavez, F.P., 1996. Glacial to Interglacial fluctuations in Productivity in the Equatorial Pacific as indicated by marine barite. Science, V. 274, 1355-1357. Pudsey, C. J., Barker, P. R, and Hamilton, N., 1988. Weddell Sea abyssal sediments: a record of Antarctic Bottom Water flow. Marine Geology, 82:289-314. Proceedings of the Ocean Drilling Program, Scientific Results, Vol. 113, p. 111-120. Rothwell, R.G. and Rack, F.R., 2006. New techniques in sediment core analysis: an introduction. In: Rothwell, R.G. (Ed. ), New techniques in sediment core analysis. Special Publications. Geological Society, London, pp. 1–29. Siriwardana, C. H. E. R. (2011). “Paleoclimatic Characterization of Arctic Ocean Sediments around the Northwind Ridge Using X-Ray Fluorescence and Visible-Near Infrared Spectroscopy.” [Masters thesis]: Kent, Kent State University, 96 p.
Spofforth, D.J.A., Pälike, H., Green, D., 2008. Paleogene record of elemental concentrations in sediments from the Arctic Ocean obtained by XRF analyses. Paleoceanography 23, PA1S09. Yurco, L., Ortiz, J.D., Leonid Polyak, L., and Darby, D., 2010, Reflectance-based clay mineral cycles in Quaternary sediments from the Northwind Ridge: implications for glacial-interglacial sedimentation patterns in the Arctic Ocean, Polar Research, DOI: 10.1111/j.1751-8369.2010.00160.x. Ziegler, M., Jilbert, T., de Lange, G.J., Lourens, L.J., Reichart, G.J., 2008. Bromine counts from XRF scanning as an estimate of the marine organic carbon content of sediment cores. Geochemistry, Geophysics, Geosystems 9, Q05009. What: This Frontier Project is an interdisciplinary project based on the volcanic island of Dominica in the Lesser Antilles. 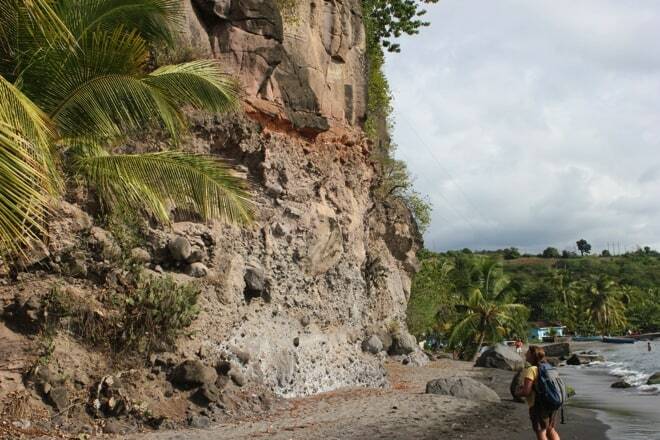 There will be two weeks of field work in Dominica, examining and sampling pyroclastic deposits, lava domes, landslide deposits, and hydrothermal waters and gasses. Our goal is to improve the understanding of the history and periodicity of these various geologic processes and how that informs the hazard potential on the island. The second half of the project will be sample preparation and initial analyses at Union College. Students will have access to rock processing equipment, an SEM with BSE and CL capabilities, an ICP-MS (laser ablation and fluid sample introduction), alkalinity titrators, ion chromatographs, and the stable isotope lab. Project Overview and Goals: The Caribbean has been the site of significant historic volcanism, from the ongoing eruptions in Montserrat to the devesating eruptions of Mt. Pelee, Martinique (~ 32, 000 fatalities), and Soufriere, St. Vincent in 1902 (~1,500 fatalities). However, the island with the most volcanic hazard risk is Dominica, which experienced the largest explosive eruption in the Caribbean in the last 200 kyr (~58 km3) and features nine potentially active volcanic centers that are Pleistocene or younger in age (Carey and Sigurdsson, 1980; Lindsay et al., 2005a), and had phreatic eruptions in the Valley of Desolation in 1880 and 1997 (Fig. 1). The rugged landscape of Dominica has also been shaped by its tropical climate and landslides, caused by storms like Tropical Storm Erika in 2015. Today, Dominica is known as the Nature Island of the Caribbean and significant efforts have been made to increase tourism. There are numerous eco-tourism sites and the Waitukubuli National Trail, an island-wide 185 km hiking trail, was recently completed. The tourism sites feature active geothermal areas, with fumeroles and steam vents, as well as older lava flows and explosive deposits of pumice and ash. Recent shallow seismic swarms in northern and southern Dominica may be indicative of volcanic unrest. The goals of this project are to understand how different processes have shaped the Dominican landscape and history in the past and how they may manifest in the future. We hope to elucidate the complicated explosive history of the island through geochronology and petrologic studies. 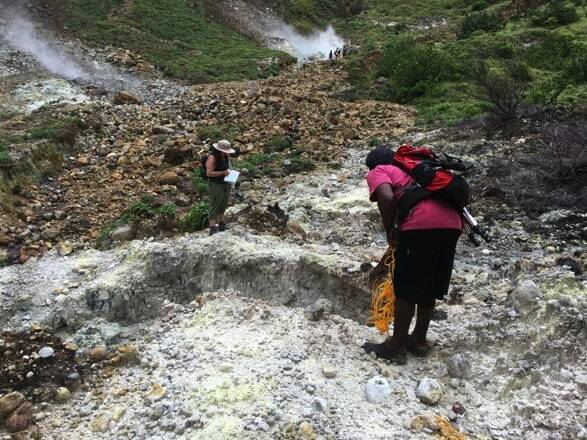 We will build upon the work done by the UWI SRC by characterizing meteoric and hydrothermal waters, as well as volcanic gasses, from fumeroles to contribute to baseline monitoring of volcanic activity for use in detecting volcanic unrest. We will also study how the landscape has affected the settlement of people and the history of landslides. Ignimbrite deposits on Dominica’s northwestern coastline. Geologic setting: Dominica is a 750 km2 island of rugged topography and pristine rainforest which features nine volcanic centers that are <2.6 Ma in age (Lindsay et al., 2005a). Dominica’s coastlines and interior valleys abound with thick (>20 m) ignimbrite deposits, composed of pumice clasts, rock fragments, and ash from solidified pyroclastic flows (Fig. 3). There have been no documented explosive eruptions of large magnitude in Dominica in the last 20 kyr. The most recent activity involving magma was a lava dome collapse. Arcaheological investigations in the late 1970s unearthed clay pots beneath an ash horizon near the village of Soufrierre. Charcoal within the ash was dated at 450 ± 90 years B.P. (Roobol et al., 1983). Dominica’s most recent volcanic activity was several explosions of steam and ash violently ejected from hydrothermal vents. Phreatic eruptions ocurred in the Valley of Desolation in 1880 and 1997, covering an area <1 km2 with a thin (~2 cm) layer of ash (Lindsay et al., 2005b). The Valley of Desolation is an active hydrothermal area and popular hiking destination of tourists (Fig. 3). At the far end of the valley lies Boiling Lake, a 75 m volcanic lake that is is typically very hot (80-90 ˚C) and acidic (pH of 3-5). In addition to the older volcanic deposits and active hydrothermal areas, Dominica’s volcanic present is recorded by earthquake swarms. The earthquakes are typically shallow (<5 km) and of fairly low magnitude (<4.0), often ocurring in rapid succession or swarms. Potential student projects: In order to better understand the magma plumbing system beneath Dominica, the potential for hazards, and how volcanism and landslides have shaped the landscape, we propose a variety of potential student projects that span several disciplines and research questions. The projects determined by the students may depend in part on the instrumentation, facilities, and faculty expertise at the home institution. Much of the analytical work can be done at Union for some projects, whereas others may require significant data collection during the fall term at national labs like U of AZ Laserchron facility or USGS-Stanford SHRIMP. Although we have done some work on the chemistry, petrology, and ages of the ignimbrites, the plumbing system from which these deposits emanated and their potential relationship to the lava domes is still largely unresolved. Continued work will allow us to determine if the explosive and effusive deposits are from a single batholithic magma chamber and erupted over a short time period (Smith et al., 2013) or if the eruptions are derived from more discrete and isolated magma batches over an extended time scale. This has implications for hazards, with respect to larger catastrophic eruptions versus more frequent smaller eruptions. There have been very few detailed petrologic/geochemical studies of the lava domes, which are predominantly andesitic and have enclaves (Crampe et al., 2015), which are indicative of magma mixing. Investigate the petrology of an individual lava dome using petrography, geochemistry, and mineral chemistry to constrain pre-eruptive magmatic conditions. Comparative effusive deposits and explosive deposits that appear to emanate from the same vent and try to determine why the eruptive style changed (i.e. determine pre-eruptive water contents with plagioclase hygrometry or temperature with two oxide thermometry). Characterize a particularly mineral phase (i.e. plagioclase, pyroxene, or apatite) and compare the textures, zoning, and compositions from different deposits throughout the island to address the potential interconnectedness of the magmatic plumbing system. Determine volatile concentrations in melt inclusions to assess whether volatile saturation was an eruption trigger. Prior to our work, only two detrital zircons had been found in Dominica (Eocene age; Howe et al., 2015). However, we have found more than a dozen detrital zircons ranging in age from 50 Ma to 1.8 Ga. This is an exciting result, which needs a much more robust dataset. It has implications for the tectonic history of the Caribbean and the transport of detrital zircons from South America. Likely shed from mountainous terrains and shed into rive basins, the zircons were incorporated by ascending magmas that erupted explosively at the surface. Determine the provenance and probability distribution of detrital zircons using U-Pb dating. Are the different zircon age populations distinctive in morphology, size, cathode-luminescence, or chemistry? Analyze Hf isotopes and determine model ages for different zircon populations. What can we learn about crustal contributions versus derived mantle sources over time? We have done significant U-Th dating of zircon rims in most of the young ignimbrites which has yielded a mixture of crystallization ages (Brehm et al., 2015) and what we believe are eruption ages. The age populations are polymodal, suggesting a complex magmatic history. Determine U-Th ages of zircon cores or do depth profiling and compare to rim ages. This will give insight into the longevity of the magma chamber, crystal recycling, and potentially a shared history between deposits. Throughout the island, there are numerous thick pyroclastic flow sequences and a few airfall deposits. These likely emanate from several vents on the island. Characterization thus far has been mostly limited to chemistry. Compare the stratigraphy of different deposits and correlate units between deposits. This could involve sampling of different pumice clasts, with texture, porosity, vesicle size/shape examined on a SEM. One could also use a geochemical or mineralogical approach to compare units. There are >365 streams and >30 hydrothermal areas. Over the last three years, we have begun an island-wide field, chemical, and isotopic characterization of meteoric and hydrothermal waters (Metzger et al., 2015; DeFranco et al., 2016; Metzger et al., 2016). The prior stream coverage, particularly with respect to carbon isotopes (Rive et al., 2013), was limited, so our data is the basis for a comprehensive island-wide baseline for future chemical monitoring. With multiple years of data, we can start to ascertain normal variations, drought induced changes, the effects of Tropical Storm Erika (August 2015), and the possible sensitivity or reaction to seismic swarms. What is the extent of the island where water has a hydrothermal signature? Is this best determined by field characterization (T and pH) or chemical tracers (Li, B, SO4) or stable isotopes (C, O, D)? Have the hydrothermal areas changed since 2000-2006 (Joseph et al., 2011), during which time volcano seismicity increased in northern Dominica? How do extremophile organisms (black and white filamentous ooze) affect the water chemistry and isotopic compositions? Was the stream chemistry affected by Tropical Storm Erika in August 2015 and were the effects regional or island-wide? How long are the effects of such a catastrophic event observed, i.e. do the 2016 and/or 2017 datasets show greater elemental flux from weathering surfaces? Volcanic gases from passively degassing volcanoes have been widely studied over the past 20 years, as changes in their chemical composition could provide information to detect new intrusion of magma as a precursor of an eruption. There is a very limited amount of data on gas composition collected from hydrothermal systems in Dominica (Joseph et al., 2011). This project aims to obtain updated information on the gas composition of fumeroles and bubbling springs across the island, for comparison to previous samples. Have the gas composition of hydrothermal areas changed since 2000-2006 (Joseph et al., 2011), during which time volcano seismicity increased in northern Dominica? What does the gas data tell us about current reservoir temperatures, and subsurface magmatic activity? In 2011, a landslide dam was breached, causing major flooding of the Layou River and the need for dredging, which continues to the present day. Prior to Tropical Storm Erika, a landslide assessment study of Dominica was done (Westin, 2015). In Schmidt’s prior work in China, students have used short-lived fallout radionuclides (137Cs, 210Pbex, and 7Be) to fingerprint relative depth of upstream erosion and sediment sources contributing to detrital river sediment. What is the distribution of landslides caused by TS Erika? How did that compare to the assessment study? How can predictive models be improved? Did landslide frequency increase after TS Erika during less extreme rainfall events? How have landslides altered the landscape in Dominica over time? Do watersheds with extensive upstream landsliding have different short-lived isotopic signatures than watersheds without landslides? What are local floodplain sedimentation rates (determined using 137Cs) in areas downstream of watersheds with and without extensive active landslides? Do watersheds with and without widespread landsliding have different clay composition in the downstream sediment? Is the sediment in detrital samples coming from surface or more recently exposed (and thus less weathered) material? 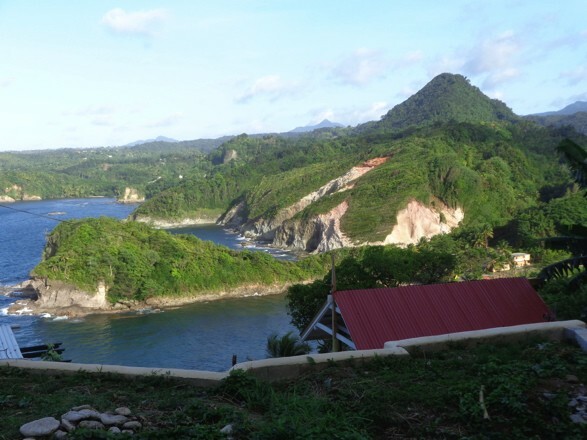 Logistics/Field Conditions: Frey has been doing fieldwork in Dominica with students for the last 4 years and Joseph since 2000, and thus both are quite familiar with the concerns of doing fieldwork in the Caribbean. There are no venomous insects/snakes or aggressive fauna in Dominica. The main safety concern is mosquito-borne illnesses such as zika and chikungunya. Anecdotally, no one in our research groups has contracted these illnesses and mosquitoes are rarely sighted in our field areas or lodging site. Government sponsored fogging and education about mosquito breeding grounds and insect bite prevention has contributed to the reduction in cases. As a preventative measure, we regularly use DEET repellant, and wear long pants/shirts and/or permethrin treated clothing. Students will fly into Melville Hall/Douglas Charles Airport in Dominica. While in Dominica, students will stay at the Springfield Guest House Archbold Tropical Research Center operated by the University of Clemson. The center has lab space, a classroom, and wi-fi. All meals are prepared on-site by the staff. In the field, students should be prepared for hot, humid weather, with temperatures 80-100˚F and potential for significant rain. The terrain is rugged and there may be a few days of long hikes depending upon the student project. However, most sampling sites are readily accessible by vehicle. Students will fly from Dominica to Albany, NY. While at Union, students will reside in University housing on campus and be given a per diem to use either in the dining center (limited hours) or for groceries. During this time, students will be processing samples, running analyses, and/or becoming more familiar with the literature pertaining to their project. Recommended Courses/Prerequisites: The potential projects described above require familiarity with concepts introduced in courses focused on igneous petrology, volcanology, geochemistry, geomorphology and GIS/remote sensing. Previous coursework in these areas is encouraged for participation in this project. In your application essay, please indicate which project area is of most interest to you and rank your top 3 choices. Also discuss any analytical equipment or expertise of your home advisor, which may be beneficial to your project. Student Expectations: If you are selected to participate in this project, you are expected to be fully engaged in the field and laboratory, both for your own project and to assist others as needed. Following the summer experience, you will continue the project at your home institution under the guidance of a home advisor and the project directors. Each student is expected to produce a thesis or comparable work during the academic year. All students will be submitting an abstract and presenting at the 2017 Fall AGU meeting, held in New Orleans (mid December). At the meeting, we will have a workshop to discuss our data, and the directors will assist students in planning a meeting schedule and interfacing with potential graduate advisors. Dominica, Lesser Antilles arc. Journal of Volcanology and Geothermal Research 7: 67-86. Dominica (Lesser Antilles). Journal of Volcanology and Geothermal Research 153: 200-220.
beneath Dominica, Lesser Antilles: Journal of Volcanology and Geothermal Research 297:9-88. Lesser Antilles: Geochemistry, Geophysics, Geosystems 16:347-365. Roseau Tuff eruptive sequence and other Ignimbrites in Dominica, Lesser Antilles. Journal of Quaternary Science 29(6): 531-546.
systems in Dominica, Lesser Antilles island Arc, Journal of Volcanology and Geothermal Research. 206:1-14. Pleistocene to Recent Plat Pays volcanic complex, Dominica, Lesser Antilles, Bulletin of Volcanology 65: 201–220. recent volcanism in southern Dominica, Lesser Antilles. Journal of Volcanology and Geothermal Research 148: 253-294. Lindsay, J.M., Smith, A.L., Roobol, M.J., and Stasiuk, M.V. (2005b) Dominica: Volcanic Hazards of the Lesser Antilles. Seismic Research Unit, The University of the West Indies, Trinidad and Tobago. Antilles: Origin of the Carbonic Acid Consumed by Weathering Reactions in the Lesser Antilles. Earth Surface Processes and Landforms 38: 1020-035.
arc? Journal of Volcanology and Geothermal Research 19: 121-134. Geology of the Mid-Arc Island of Dominica, Lesser Antilles—The Surface Expression of an Island-Arc Batholith. The Geological Society of America, Special Paper, 496.
phenocrysts to fingerprint tephras in Dominica: Northeastern section Geological Society of America Abstracts with Programs, Vol. 47. Dominica: implications for magma plumbing systems: Northeastern section Geological Society of America Abstracts with Programs, Vol. 46, No. 2, p. 120. America Abstracts with Programs, Vol. 47.
a volcano-hydrothermal system in Dominica, Lesser Antilles. Northeastern section Geological Society of America Abstracts with Programs. Vol. 48, No. 2. Antilles: Northeastern section Geological Society of America Abstracts with Programs, Vol. 46, No. 2, p. 120. Abstracts with Programs, Vol. 45. Dominica, Lesser Antilles. Northeastern section Geological Society of America Abstracts with Programs. Vol. 48, No. 2. Northeastern section Geological Society of America Abstracts with Programs, Vol. 46, No. 2, p. 120.
meteoric and hydrothermal waters in Dominica, Lesser Antilles. Geological Society of America Abstracts with Programs. Vol. 48, No. 7.
hydrothermal waters in Dominica, Lesser Antilles. Northeastern section Geological Society of America Abstracts with Programs, Vol. 47.